Have you heard about the new one pound PC? I heard about it on Slashdot on Wednesday. It's an impressive example of thinking different, something Apple certainly doesn't have a monopoly on. 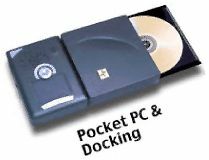 The Pocket EPC System is small. At 5.9" long, 4.2" wide, and 1.25" thick, it's about the size of a stack of 4x6 file cards. In the photo, the computer itself is the smaller piece next to the CD-ROM/floppy drive docking module - it may be the first computer smaller than a Diskman. Starting at $899 with the dock, the base system includes a 466 MHz Celeron processor, Windows 98, 64 MB of memory, a 6 GB hard drive, a speaker, PS/2 keyboard and mouse ports, microphone and earphone ports, two USB ports, a VGA port, and S-video out. It also has a touch pad built right into the computer. As if to stress the Pocket EPC's portability, it even comes with a carrying case. Just set it down, connect it to a monitor and keyboard, plug it into the electrical outlet, and you're ready to compute. This one pound wonder is smaller than most external drive cases - much smaller. I've been inside the iMac, which has one of Apple's smallest system boards ever, but don't think you could pack it into a case this small, although I would love to see Apple produce a computer like this. Picture it. Instead of toting a hard drive or Zip disk with files between home and work, you could toss the whole computer in your brief case or large purse. You could work anywhere that has a keyboard and monitor. This could share a lot of iBook and PowerBook parts, but eliminating the need to run off battery power and the expensive flat panel display. We're looking at something about the same size as a 500 page mass market paperback (which I just measured at 4.1" wide, 7" tall, and about 1-1/4" thick). Wow! I'll even suggest a name: the MacBook.